On 11 April Szent István Universty celebrated the Hungarian National Poetry Day again. The event was organized by SZIU Media Centre, International Relations Centre, Hajós Alfréd Primary School and Young Artists of Gödöllő Association. Reciting Attila József’s On My Birthday together in the garden of the main building has been a tradition at SZIU for years now but this year’s performance was special in several respects: Firstly, this year not only the famous poem itself but two of its contemporary paraphrases were recited too. 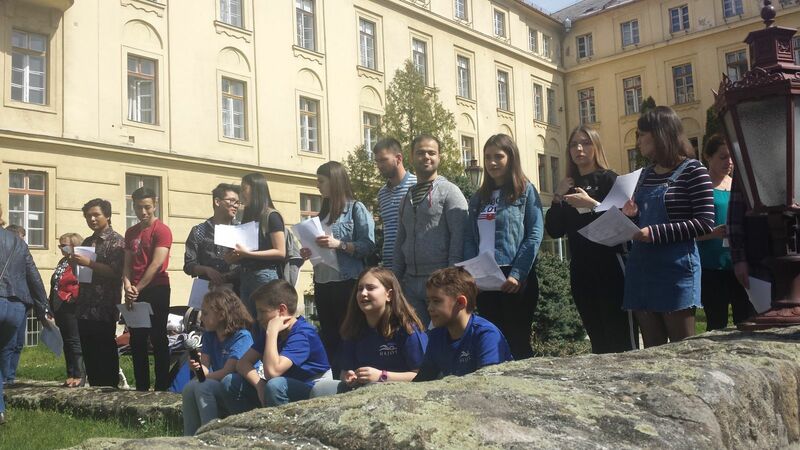 Secondly, children from Hajós Alfréd Primary School also contributed to the event since they “attend” our university this semester while the primary school building is being renovated. Last but not least, a group of our international students joined the recitation for the first time. The audience had a remarkable experience when they could listen to Attila József’s lines in English, Indonesian, Vietnamese, Korean, Serbian, Albanian, Russian, Arabic, Swahili and French – the verses were translated by the students themselves into their mother tongues. As Dr. István Szabó, Vice-Rector for International Affairs highlighted, it is always an exciting moment when we have the opportunity to broaden our horizon by crossing boundaries both literally and figuratively. Many thanks for everybody who performed, contributed, organised or just enjoyed the celebration. See you next April again!